Importante ripubblicazione per la prima volta in cd di due album di Johnny 'Mbizo' Dyani, riuniti per inaugurare una speciale serie di ristampe per i quarant'anni dell'etichetta Cadillac: Rejoice, uscito postumo nel 1988 - le registrazioni sono del 1972 - con Mongezi Feza e Okay Temiz e Together, uscito anch'esso postumo nel 1987 - con registrazioni di fine 1979/inizio 1980 - a nome del settetto Witchdoctor's Son, con la partecipazione di Dudu Pukwana. 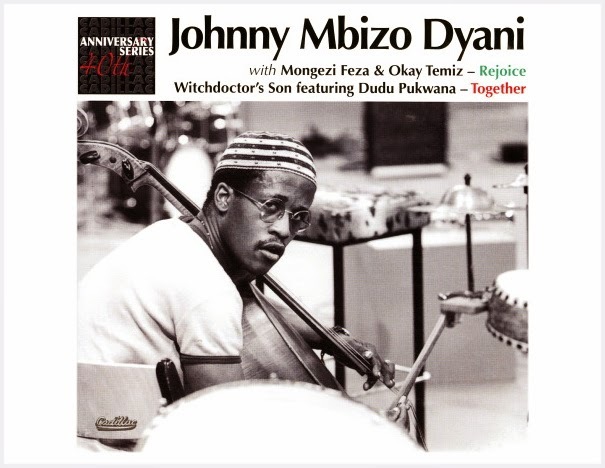 This first release in Cadillac's '40th Anniversary Series' brings together two albums by the great South African bass player Johhny Mbizo Dyani, both originally released by Cadillac on vinyl and never before issued on cd. Rejoice is a trio album with Dyani's compatriot Mongezi Feza and Turkish percussionist Okay Temiz, recorded at the Museum of Modern Art in Stockholm in October 1972, during a Swedish tour. Sadly by the time the album was actually released in 1988 only one member of the group remained, Feza having died in 1975 aged 30 and Dyani in 1986 aged 39. Both musicians had left South Africa as members of the Blue Notes group, settling in London never to return to their apartheid homeland. Together was also recorded in Stockholm, where Dyani was by then living, in Dec 1979 / Jan 1980. The group was put together specially with Dyani's old cohort Dudu Pukwana invited over from London to play. 'The music is very special. Transcending the boundaries of nations and cultures, Mbizo s enthusiasm spread and inspired the sessions with his intense passion. A passion which revelled in a nostalgia for the myths and melodies of Marabi and Kwela. Mbizo s life was music, he gave his life for music. These sessions are Mbizo s own testimony to the spirit of hope for the future, for a better world. It is a statement so filled with vitality and with the joy of rediscovered roots that it will stand as a signpost to the whole of his life and work.